Last week I published part 1 of the Ziggy Stadust creation about the make up and hair designs for this stage persona. 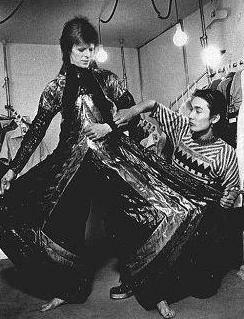 This post is about his clothes, designed by Kansai Yamamoto and the influence of Angela Barnett, the wife of Bowie those days. 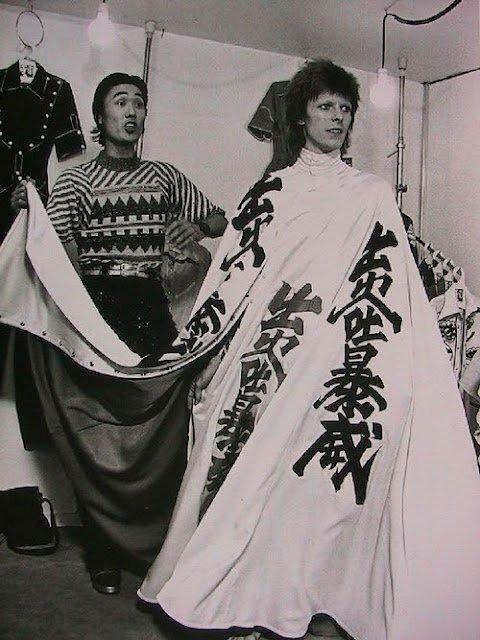 Kansai Yamamoto (1944) was the first Japanese fashion designer to hold a collection show in London in ’71. This smart move brought him an international spotlight and introduction to stars as David Bowie and Elton John..
Born just after the Second World War, Kansai Yamamoto was raised in a new Japan. Studying both engineering and English at university, he would eventually incorporate the futuristic, the imaginative and the technologically innovative and channel them into fashion, his creative medium of choice. In many ways Kansai’s unique output would become the signature of the rebirth of his home country. 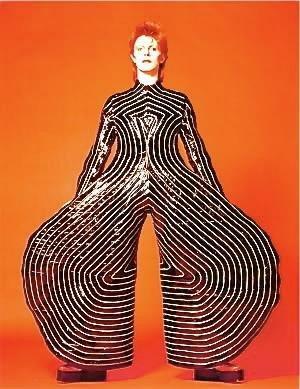 If you look at the fantastic creations he made for David Bowie’s alter ego’s Ziggy Stardust and Aladdin Sane it’s clear his artistry is hugely influenced by not only the glam and glitter of the 1970s but also by pre-war Japan as well, from silken kimonos and Kabuki to the ornate armor of the Samurai, his exuberant designs contrast with the Zen-like simplicity and deconstructed silhouettes favored later by designers such as Yohji Yamamoto, Rei Kawakubo and Issey Miyake. 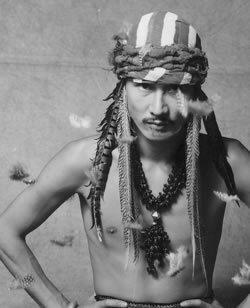 In the 1970s and 1980s Kansai Yamamoyo is one of the leaders in Japanese contemporary fashion. He was the first to go international and opened ‘Boutique Kansai’ in mayor cities around the world including Paris, Milan, New York, Madrid and London. The in 2010 unveiled Skyliner train, that connects Japan’s Narita Airport with central Tokyo, is also a design by Kansai Yamamoto. Before Ziggy Stardust was created, David Robert Jones performed under his artist name David Bowie (named after the Bowie knife). David knew he wanted to be a singer-songwriter-performer from an early age on. He met Angela Burnett in London through a mutual friend, Chinese-American record executive Dr. Calvin Mark Lee in 1969. A year later they got married. 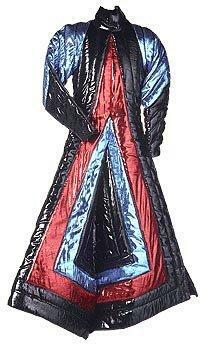 Angela had an outrageous character, she embraced everything that was going on in London those days. 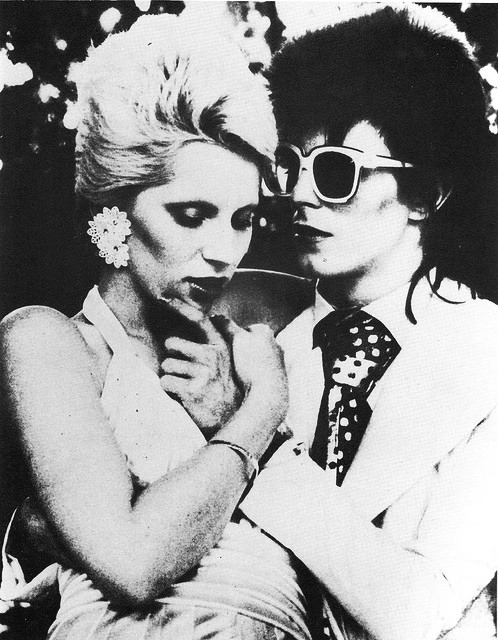 David Bowie needed a person like her to inspire him and help him change his image. 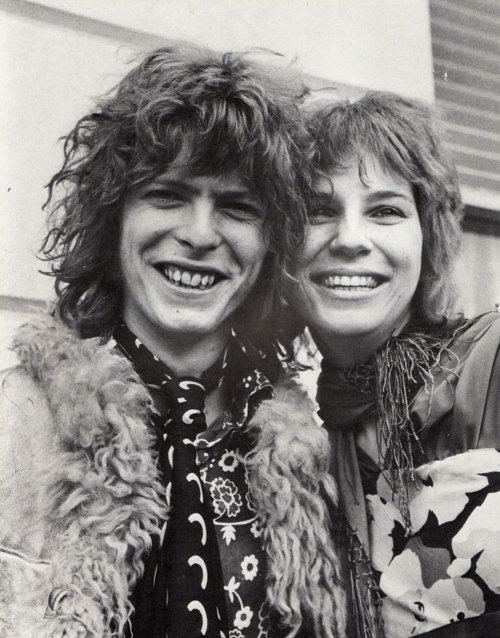 When they met David still looked like a longhaired bohemian. Little by little David started to change, he also announced he was bi-sexual, this definitely also under influence of Angie, who lived a bi-sexual lifestyle too. 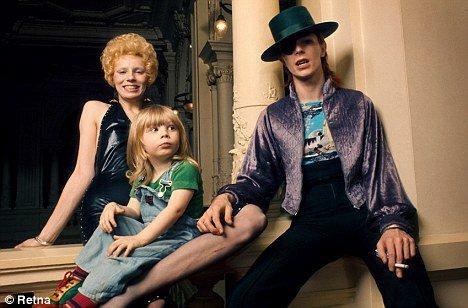 David became more experimental with his looks and got nicknamed ‘Wowie Bowie’. 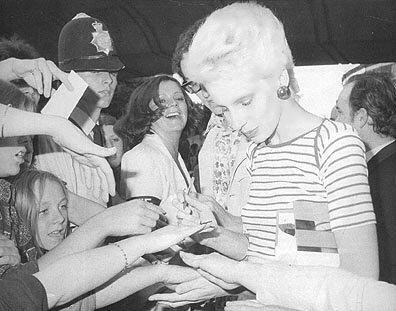 Angie loved their appearances together and they even did a fashion shoot with fashion photographer Terry O’Neill. On May 30, 1971 David and Angie had a son they named Duncan Zowie Haywood Jones. Zowie later preferred to be called Joe and nowadays works under the name Duncan_Jones (he directed his first movie ‘Moon’ in 2009). In the D.A. 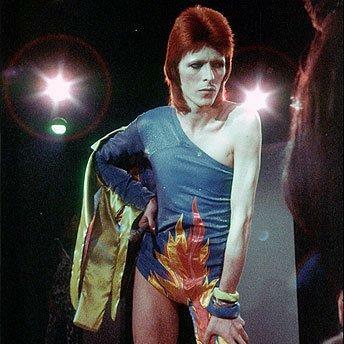 Pennebaker concert film Ziggy Stardust: The Motion Picture Angela appears backstage. I saw the movie years ago and remember the part with Angie vividly because she behaved so annoyingly. David and Angie separated after eight years of marriage and divorced on February 8, 1980. Angie was disappointed the marriage ended and in 1993 she wrote a bestseller Backstage passes, Life On The Wild Side with David Bowie, a book in which she doesn’t speak well about David. Her settlement was 300.000,- pounds if she didn’t speak about her life with David for ten years. 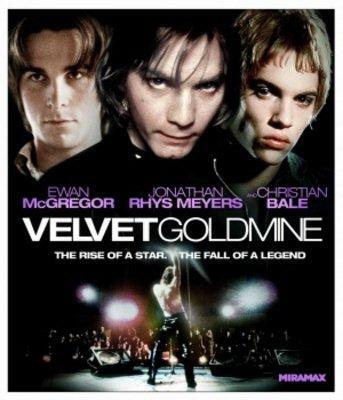 The movie Velvet Goldmine (1998) by Todd Haynes is about the Glam Rock years based on the life of David Bowie, but it’s not the real story! !